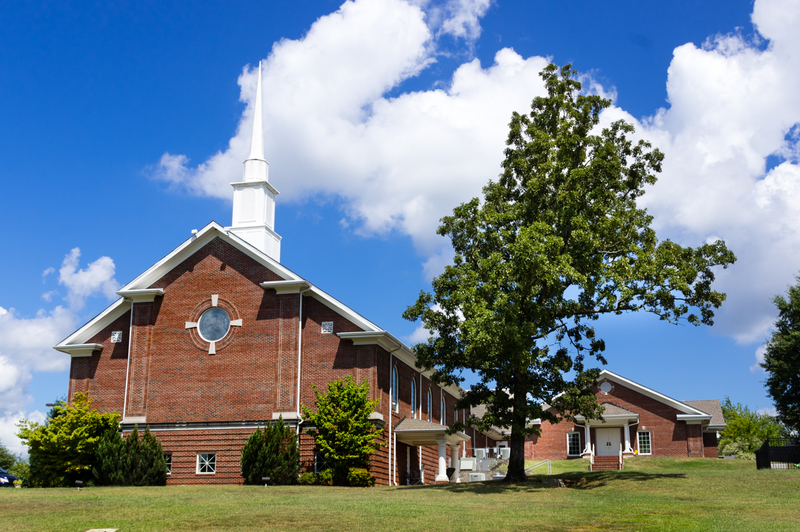 The Huntsville Foundations of Faith Trail churches define the heart of the area&apos;s rich and diverse cultural and spiritual heritage. Each of these churches has a story to tell. Some churches have been designed by experienced architects and some were designed by church members who "felt the calling." The stained glass windows are breathtaking. They become warmer and vibrant with the sun&apos;s light. Beautiful gothic, cathedral-like structures are truly great wonders of art. 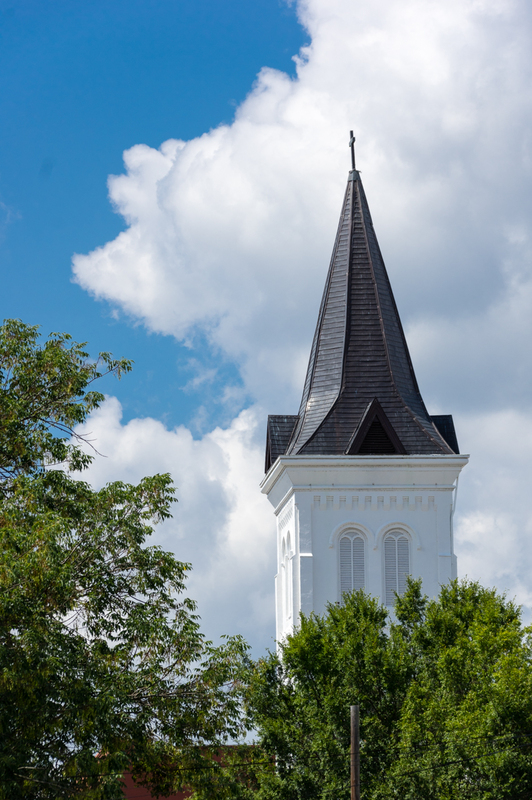 Tall elegant steeples rise into the sky bringing one closer to the heavens. 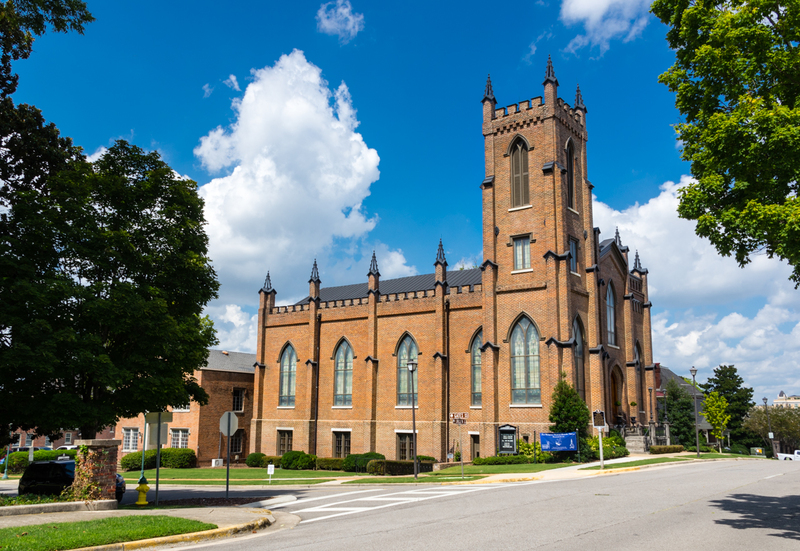 Whether you choose to visit one or all of the churches on the Foundations of Faith Trail we wish you a safe trip. 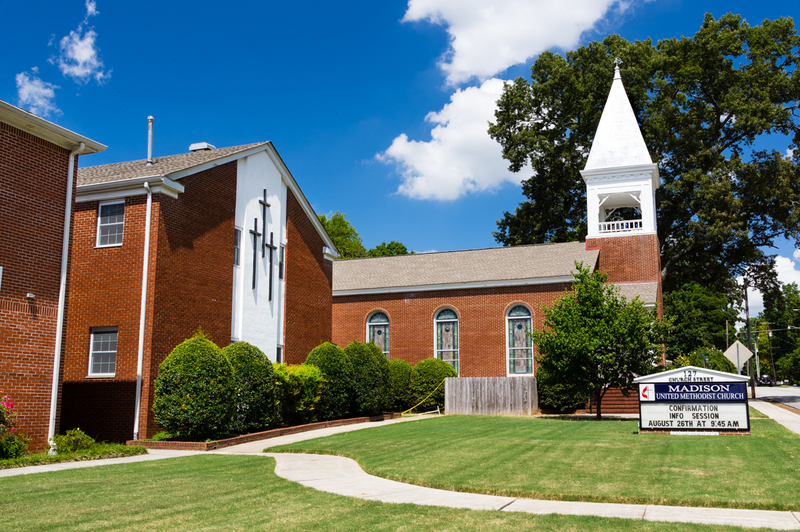 Central Presbyterian Church - 406 Randolph Avenue SE, Huntsville, AL 35801-4199 Established in 1812, the Central Presbyterian congregation moved into its current building in downtown Huntsville in 1906. 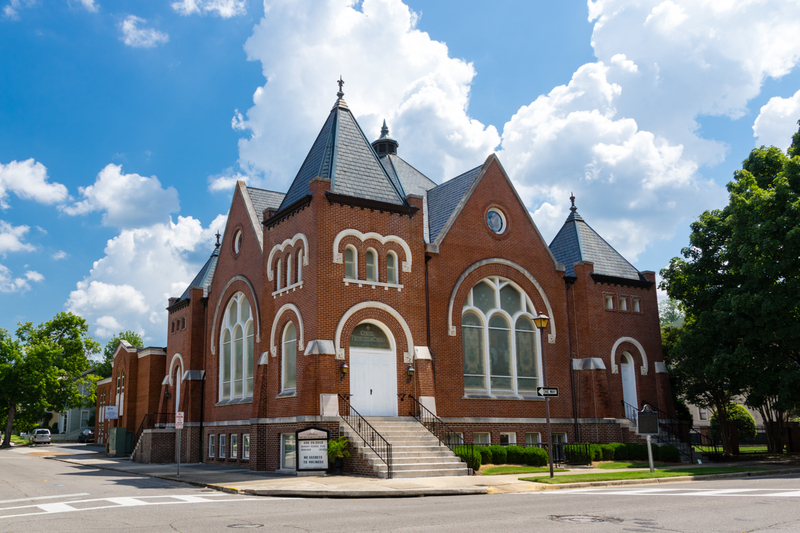 Church of the Nativity Episcopal Church - 208 Eustis Avenue SE, Huntsville, AL 35801-4293 Organized in 1842, the Church of Nativity site has buildings from 1847 and 1859 (the current main church), and features a large nave and 151 foot spire. First Presbyterian Church - 307 Gates Avenue, Huntsville, AL 35801 One of the state’s oldest Presbyterian churches, First Presbyterian dates from 1818 and has been in its current building since 1860. First United Methodist Church - 120 Greene Street, Huntsville, AL 35801 With origins in 1805, the congregation completed their third and present church in 1868, with additions in 1924, 1956, 1985 and 2000. Holmes Street United Methodist Church - 501 Holmes Avenue NE, Huntsville, AL 35801 The Holmes Street UMC has been located at it’s current location since 1909, when Holmes Avenue was named Holmes Street. Additions were added in 1958, 1967 and 2013. Randolph Church of Christ - 210 Randolph Avenue, Huntsville, AL 35801 Completed in 1889, the congregation organized as a community in 1883 holding services in the courthouse as a Christian Church. St. Mary of the Visitation Catholic Church - 222 Jefferson Street N, Huntsville, AL 35801 Constructed of native stone hauled from Monte Sano, the cornerstone was laid in 1861, but construction was suspended for the duration of the Civil War. The Church was completed in 1872, saving the fresco, and dedicated in 1877. Temple B&apos;Nai Sholom - 103 Lincoln Street SE Huntsville, AL 35801 Sharing the same architect with the nearby Central Presbyterian Church, the Temple was dedicated in 1899 and restored in 1994. 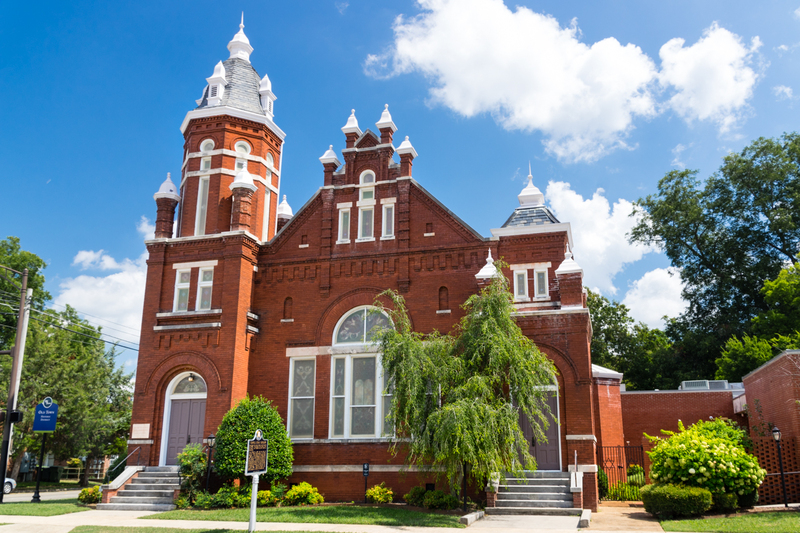 Temple B’Nai Sholom is the oldest synagogue in continuous use in Alabama. Ford&apos;s Chapel United Methodist Church - 280 Ford Chapel Drive, Harvest, AL 35749 Founded in 1808, Ford’s Chapel was the first Methodist Church established in what is now Alabama. Resting on the floor joists from the original 1819 structure, the old sanctuary was built in 1870. Gurley United Methodist Church - 121 College Street, Gurley, AL 35748 Constructed in 1891, only one year after the town incorporated, the church is an example of vernacular Gothic Revival. Madison United Methodist Church - 127 Church Street, Madison, AL 35758 Located in what is now old town Madison, the church was originally a one room frame building. This was brick veneered as part of an expansion in 1947, renovated in 2008, and is still in use. New Market Presbyterian Church - 1725 New Market Road, New Market, AL 35761 The third church on land deeded in 1849, the present Church was erected in 1888 and features hand carved woodwork by local craftsmen. Walnut Grove Cumberland Presbyterian Church - 729 New Hope Cedar Point Road, New Hope, AL 35760 Rebuilt after the original church was burned by the Union Army, this small white clapboard church retains it’s original hand dug well, pre-War cemetery and tongue and groove walls. 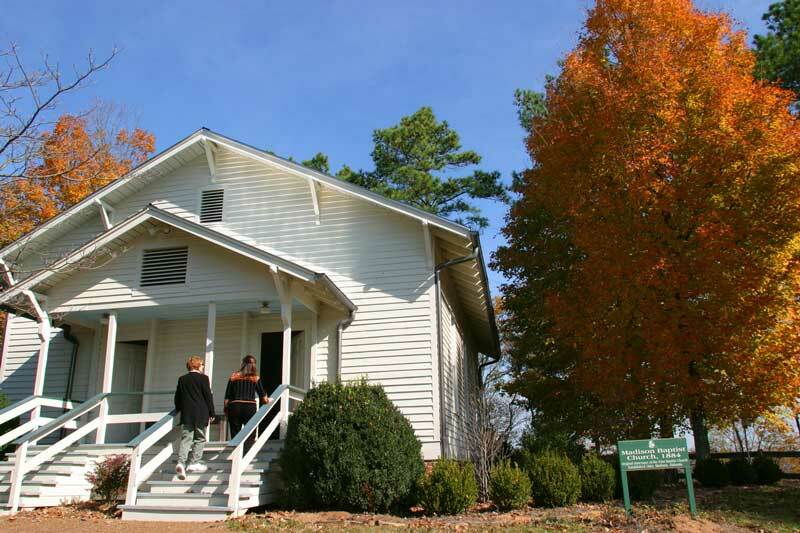 Church at Burritt on the Mountain - 3101 Burritt Drive, Huntsville, AL 35801 Built in the 1880’s on the Corner of College and Sullivan Street in Madison, the Madison Baptist Church, the original building was moved to Burritt on the Mountain and rededicated in 1891.